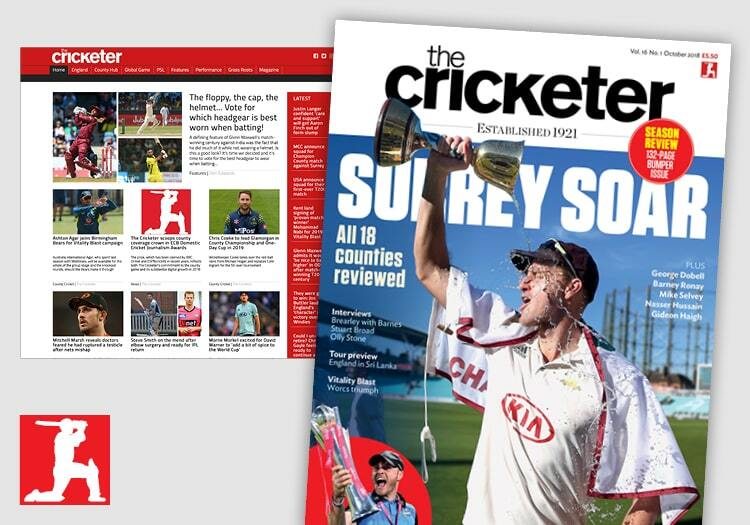 The Cricketer is the best-known and most repupable publishing brand in the game, connecting with six-million enthusiasts through our print and digital channels. Our magazine audience is affluent, over 50 and consumes media in a traditional manner, essentially reading the title cover-to-cover, while our digital audience is younger, highly engaged and growing. These two distinct audiences are linked by a love of cricket and The Cricketer. 2019’s huge summer of cricket will conclude with the Ashes and The Cricketer will be producing extended coverage of cricket’s greatest rivalry. We are delighted to announce that we will be working with Cricket 19, the official game of the 2019 Ashes, throughout the series, and there are many more marketing opportunities on offer. Our magazine continues to be the market-leading title as we approach our 100th anniversary. Throughout the summer, The Cricketer will be looking ahead to the Ashes while the August issue will be our Ashes preview special. Included will be a full preview of both sides, a ground guide of all the venues, interviews with players from both countries, a feature looking back to Ashes series of the past and our editor Simon Hughes’ verdict on the series. Our audience are affluent and loyal, proven by the fact that 60% have been subscribers for over 10 years. They trust the magazine, as well as those who advertise within it. With display advertising, promotional features, and tailored supplements our audience will engage with your brand. If you are targeting the grey pound there is no better place to advertise. There will be a member of our digital team present at every day of every Test in the series. They will be writing match reports, features and interviews for our award-winning website. Readership on the site has grown 350% over the past 12 months and this will continue to grow as cricket takes centre stage this summer. Oppurtunities to connect with this young and engaged audience include: display advertising, social media campaigns as well as alignment with our Ashes content. The Cricketer provide creative, digital and strategic services to our clients that will engage your brand with a rapidly evolving, dynamic sport. Opportunities include conceptualising and delivering advertising and experiential campaigns, to creating content, websites and film. For more information, please download our media card here or contact Jim Hindson on 0203 198 1354 or email jim.hindson@thecricketer.com.